No matter how often you wash your tile floor, it's not really clean unless you are also taking care of the grout. Those tight, little lines of rough, porous surface are magnets for dust and germs, and once your grout has discolored, it can make the entire floor look old and dull. You will find many suggestions for homemade tile grout cleaner, but most of them will not be strong enough to tackle the particular challenges of cleaning grout. Your best bet is a commercial grout cleaner and, for particularly stubborn dirt, a grout steamer. Grout is needed to adhere your tiles to the underflooring and also to fill in the spaces between the tiles. It comes in many different types, but the three most common are unsanded, sanded and epoxy. Grout is made up of cement (usually Portland cement), an aggregate and water. Unsanded grout is generally used when the space between tiles is less than 1/8 inch wide. It adheres better to vertical surfaces and is often used on marble, where flecks of sand could scratch the surface of the tile as the grout is applied. Sanded grout contains silica sand and is most often used for tiles that are set farther apart than 1/8 inch. It has a coarser texture than unsanded grout. Epoxy grout is used mostly by professionals in situations where the tile may be exposed to acids or oils that could interfere with the adhesion of sanded or unsanded grout. It is not recommended to use homemade grout cleaner that contains vinegar or baking soda. Vinegar is acidic and can actually break down the grout. Baking soda is alkaline, but it really isn't powerful enough on its own to be an effective tile grout cleaner, and mixing it with vinegar does not have enough effect on its acidity to make it safe. Hydrogen peroxide is usually sold so diluted that it is not strong enough to clean grout. While bleach is strong enough, but it is also toxic and releases harsh fumes. There are many commercial grout cleaners and grout bleach available, and a lot of them are nontoxic. You can also use an alkaline floor cleaner or oxygen bleach. This is sold in powdered form. 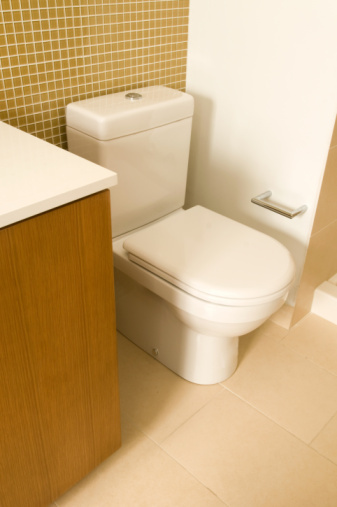 For mildly soiled grout, you can mix the powder into a bucket of warm water and splash it over the floor. Let it sit for 15 minutes and then mop it up, paying special attention to the grout. Rinse with clear water and use towels, shop cloths or a wet/dry vacuum to remove any remaining water. For very old or deeply soiled grout, mix the powdered oxygen bleach with warm water into a thick paste and then apply the paste to the grout. Oxygen bleach is nontoxic and has no harsh fumes, so you can apply it with an old toothbrush or put on dish-washing gloves and apply it with your fingers. Let the paste sit for five to 10 minutes and then scrub it with a grout brush. Wear knee pads or kneel on a folded towel to help protect your knees from the hard tile. Rinse the floor by mopping it with clear water. This may not get all of the oxygen paste bleach off of the floor, so go over it thoroughly with a clean, lint-free cloth dampened in clear water. Wring or rinse the cloth frequently as you work. Several companies offer grout-cleaning machines for purchase that work with steam, and most home improvement stores have them available to rent. 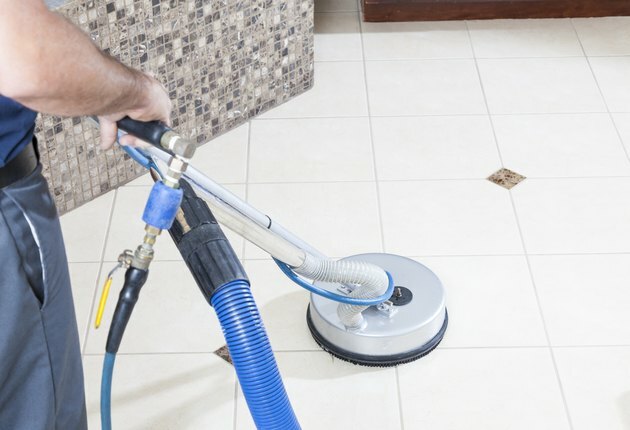 Steam cleaners use pressurized steam to clean tile and grout. Read the instructions carefully before adding any sort of cleanser to the water to avoid damaging the machine. Follow the manufacturer's instructions for filling and starting the machine, and then simply move the steam cleaner's wand slowly over the floor the same way you would use a vacuum cleaner on carpet. Pay special attention to high-traffic areas. Let the floor dry completely before walking on it.